Over a year ago I said Google would never implement a fact based assessment in their algorithm because I thought they would understand that making such a change would be the first step to losing their search monopoly. The maniacs actually did it. It’s still uncertain exactly what they have implemented since Google tends to not tell people how their algorithm works, but they did make an announcement back in April that they would be taking measures to punish “low quality content” such as misleading information, offensive results, hoaxes and conspiracy theories. Though I have said this many times already, it seems necessary that I say it every time: I love accuracy in reporting. I care deeply about the truth, and lies and misinformation upset me a great deal. I believe that most of our problems in life can essentially be traced back to false beliefs, and as such, the ideas, stories and lies which create and reinforce false beliefs are the very things which perpetuate the problems we so desperately wish to solve. Curbing the spread of misinformation and fighting false beliefs has been my main life purpose for over five years now. So on its face value, I kind of love the fact that Google (and Facebook etc) are trying to take out the rubbish and get rid of misinformation from their results. I nearly always align the with the judgements they make on what is and isn’t fake, and I believe that most rational, sensible, honest people will agree with that sentiment. So my criticisms here are not in defense of the content being flagged, penalised and/or filtered. My criticisms here are consequence based. I believe that all of these good intentions give us an outcome far worse than the current situation we find ourselves in. I have already written an overview of these concerns, which you can read here. I am aware that I need to provide a more detailed explanation of each of the points in that article and hope to do so shortly. This article though is not so much about laying out the multiple arguments theoretically, but instead making public note of some of the real world consequences as they play out in front of us all. They believe that they have been unfairly targeted by the new Google algorithm changes and punished for holding political views which deviate from the mainstream media. In the article they show their recent Google search engine traffic stats and how it has been in continuous decline since the announcement was made, leading up to a sudden drop about a month ago. Organic(?) 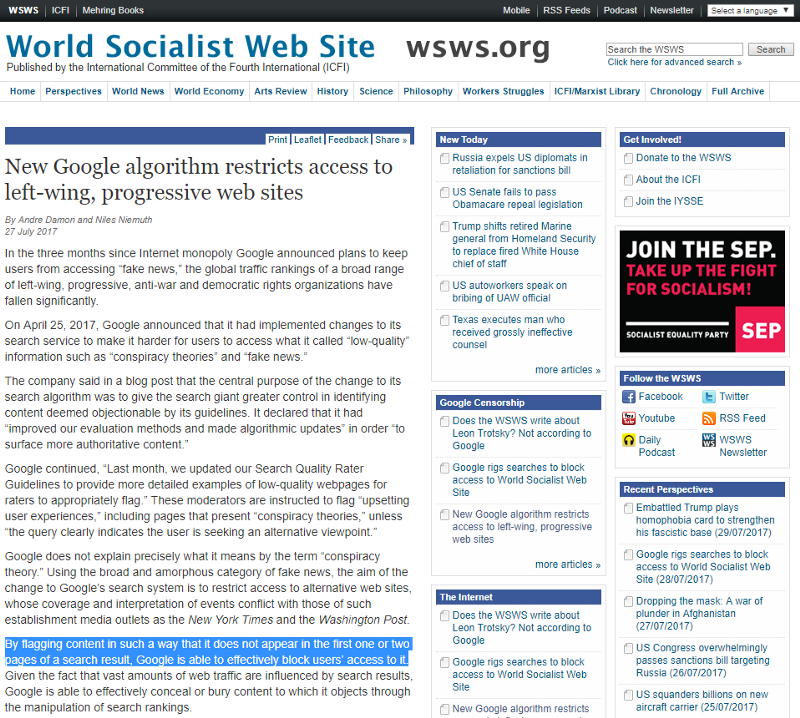 search traffic from Google to World Socialist Web Site. It would be great if we could see the wider context of this chart. Was traffic declining before April? Is this only organic search traffic? Did they do and paid search during or before this period? Did anything else change around the time of the large drop visible here? In the discussion about this article within the /r/SandersForPresident subreddit, the top comment argued that this decline is far more likely to be from the poor SEO (Search Engine Optimisation) practices of the website than from any intentional punishment at the hands of the new fake news changes. That argument could be right, but it is curious that there is a clear break from the consistent gradual decline into a significant dip and loss of regularity about a month ago. That does look a lot more like a significant change of some nature, rather than a consequence of ongoing failed SEO practices. Assuming the website itself made no significant SEO changes at that time, it is understandable why they would connect the drop in search traffic to the algorithm change Google had recently announced was about to be launched. Especially since the content they publish would frequently be considered conspiratorial by many, and at odds with the larger mainstream media companies. Google had explicitly declared that “conspiracy theories” are one of the topics they would be punishing. I think their belief that they are being punished at the hands of this algorithm is fair enough. However, whether they actually have been penalised on this basis or not is completely irrelevant. What matters is that Google announced this change, and now a community of people feel like Google has begun censoring their perspective. These are the facts that really matter because now we have another large community of people feeling like Google can’t be trusted to be the neutral portal to the web that we all expect it to be. As the number of people who feel this way increase in number, and in certainty, the pressure for new alternative search engines will increase, and Google will inevitably lose market share. By flagging content in such a way that it does not appear in the first one or two pages of a search result, Google is able to effectively block users’ access to it. As soon as [Facebook] start controlling what information is shared in their newsfeed (even if it isn’t absolute control, like deleting content, but only ‘flagging’ it, or applying a negative pressure to its edge score so fewer people see it), they will be exerting an editorial pressure, and they will be one step closer to being another Fox News, rather than a platform synonymous with The Internet itself. Which was a poorly worded way of saying “If you flag or penalise some results, you effectively censor them”. You don’t have to delete something to make it disappear. When I raised this point at the Workshop on Digital Misinformation in April this year, it was met with a comment about this approach not being “true censorship” because it doesn’t intentionally censor a particular group or ideology. The circumstances didn’t allow for a meaningful discussion at the time so I couldn’t respond (I was just an audience member asking a question after a presentation), but the technical definitions of censorship are largely unhelpful to the communities who feel like their voices are being suppressed by incredibly powerful multi-national companies who act as gate-keepers to all information on the Internet. What the admin of World Socialist Web Site is saying here is spot on, and it perfectly captures the point I really hope to convince everyone is incredibly important: Google and Facebook have the power to flag and penalise information out of existence. They act like it is ‘just flagging’ or ‘just applying negative pressure within the algorithm’, but it does not change the real world consequences of the act. The objective is to make the information disappear, and that is exactly what it will achieve. All flagging and penalising of information necessarily trends towards censorship of that information. I’m not sure how many people have changed their minds about a core belief because a multinational corporation or national government declared that their belief was wrong and would be censored out of public discourse. I doubt the number would be very high. This cynical glee also overlooks the fact that ‘those people’ aren’t a single group of people anyway. 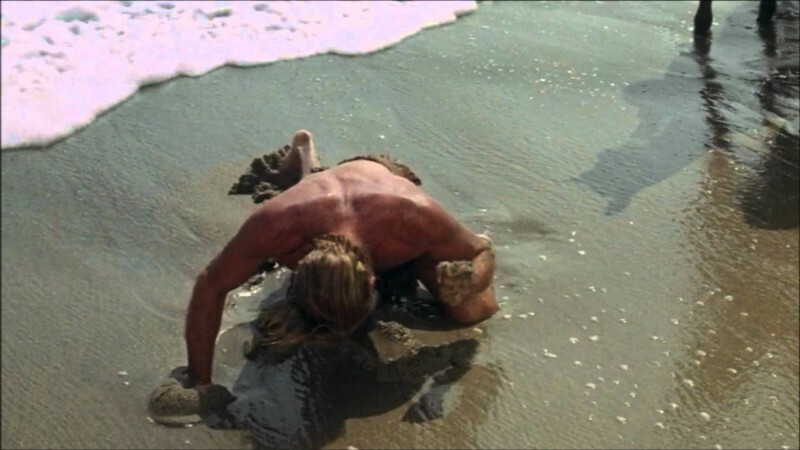 Everyone falls for something at one time or another, and our ability to cling to false beliefs with everything we have seems to be a feature of our brain more than an accident. So when you gloat over the fact that “those conspiracy idiots” are being pushed out of Google and Facebook, just remember that 42% of the US population believes God created humans in their current form. 63% of the population think genetically modified foods are not generally safe to eat, despite overwhelming consensus among scientists. 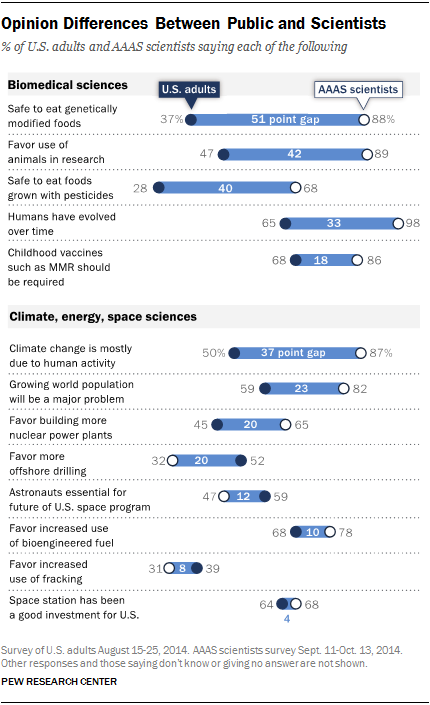 50% don’t believe climate change is due to human activity. Infowars.com has between 2 and 4 million visitors every month. Public perception rarely aligns with scientific research. Most people are wrong about most things. In other words: these ‘idiots’ that we are so eager to see ostracised by Google and Facebook are the people we work with. They are our families. Our acquaintances. Our neighbours. They are the average person. Get out of your highly educated intellectual bubble for just a few minutes and realise that you are talking about 90+% of the population when you gleefully rejoice in ostracising people who believe things which are demonstrably not true. First they came for the Socialists…. In case you aren’t keeping track, the socialists aren’t actually the first community to feel like these moves to start punishing content on the basis of how true it is directly attacking them. Obviously the Alt-Right and people who are fans of Infowars and that world perspective feel very threatened and have been critical of Google for a long time now. So now, already, we have at least three large, independent communities feeling attacked and censored by Google. Of course, most of their fear mongering and conspiratorial thinking is disconnected from reality here, but again, that is mostly irrelevant. They can now backup their conspiratorial thinking with statements directly from Google, published in mainstream media, admitting that they are now suppressing information which Google deems conspiratorial or ‘not mainstream enough’. All that needs to happen next is for Google to continue to implement this system, and have the scope slowly creep to more and more topics and conspiracies. As that happens, more communities will notice their content being penalised and will report it just as The World Socialist Web Site has here. 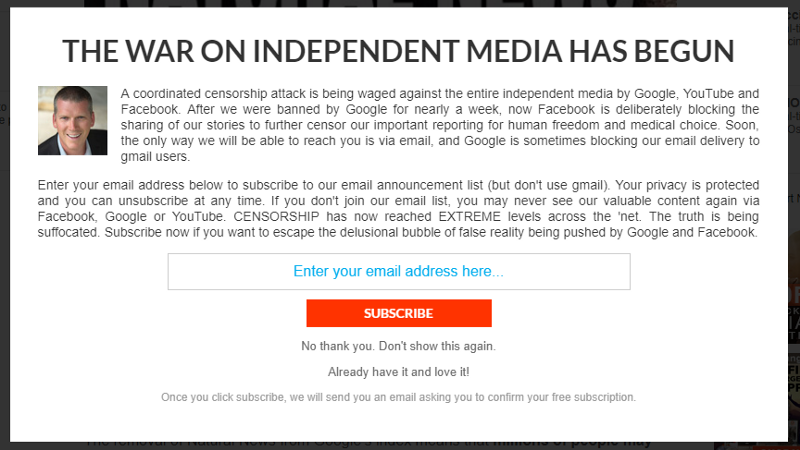 Increasingly more people will be receiving this same message from two, three, four or more of the websites that they frequent and enjoy the content of, and they will feel like Google is oppressing them and their beliefs. Whether they are correct or not is irrelevant. They will simply take this new information that Google is censoring them and their community, look for confirmation of that belief, and find these earlier stories validating it as true. The erroneously conspiratorial tones taken by Natural News may end up looking like prescient warnings to the people who find themselves in this situation over the coming years. And finally, we get to my biggest problem with what is happening here. the aim of the change to Google’s search system is to restrict access to alternative web sites, whose coverage and interpretation of events conflict with those of such establishment media outlets as the New York Times and the Washington Post. I genuinely fear for the true conspiracies which will be suppressed because the mainstream media will be manipulated into mis-reporting or overlooking them, and the fringe websites that report them accurately will thus be penalised for going against the mainstream narrative. As true as it is that most conspiracy theorists are just flat out wrong and deluded, that doesn’t change the fact that history is full of real conspiracies which the media failed to blow open. History is full of examples of public manipulation at the hands of a pliant mainstream media. Alternative media has an important role in combating the flaws and biases of mainstream media, and you don’t need to be conspiratorial to believe that.Noam Chomsky’s Manufacturing Consent. If you haven’t read the book or watched this documentary, you really should. I will keep an eye out for the next communities to start complaining about censorship by Google or Facebook and will follow up on this story as I encounter them. As long as the primary portals for accessing information online are pursuing a path of suppressing information, new people and communities will find themselves being flagged or penalised at one time or another, and they will be upset by it. And this will snowball into a bigger and bigger problem. Censorship will never work in the information age. A different approach must be taken. My next article will be an overview of my vision for The Socratic Web, the only approach which I believe can possibly work.